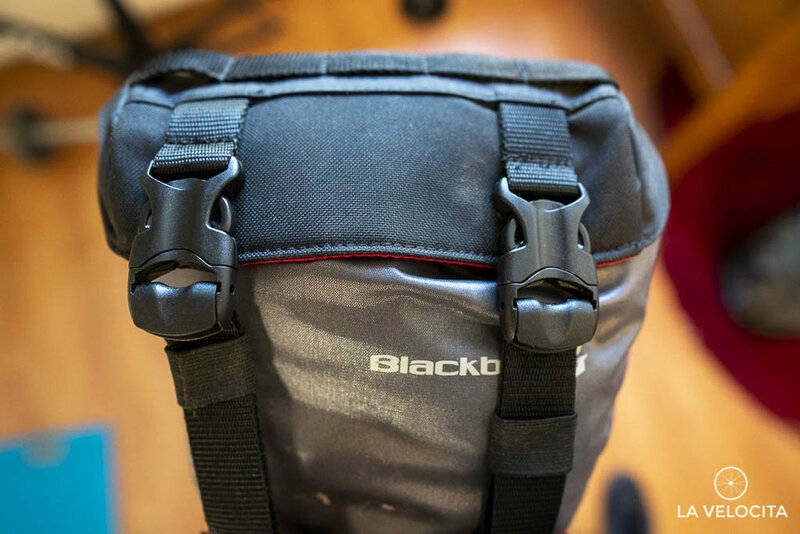 Blackburn Outpost Seat Pack review - LA VELOCITA. The adventure/bikepacking saddlebag market is mostly split across two designs: the all-in-one-it’s-just-a-single-bag system that Apidura popularised and the two-piece cradle and dry bag system. The Blackburn Outpost is the second kind. I’ve owned Apidura bags for years so I was keen to check out what Blackburn’s system has to offer. 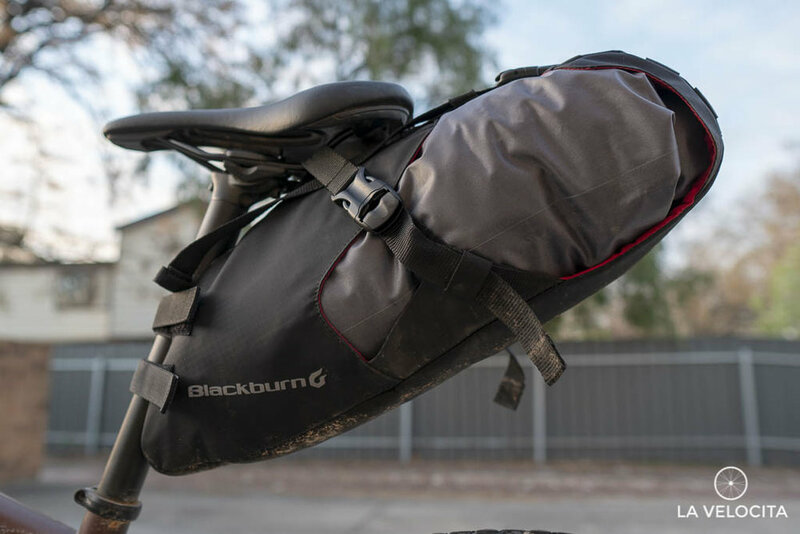 Blackburn has put together a simple and utilitarian seat pack with the Outpost. Carrying capacity is 10.5 litres from the dry bag, and it tips the scales at 516 grams. There’s basic velcro straps to anchor the bag around your seatpost, two clips that connect the underside of the cradle to loops that thread through the saddle rails, and two more straps that adjust the fore-aft length of the bag and release the cradle to pull out the dry bag. The dry bag itself is a simple cone shape that’s closed by rolling it over itself and pulling the clips together. There’s webbing on the rear of the cradle that lets you attach sundry extras like lights or other bags. It’s perfect for hooking a carabiner onto. 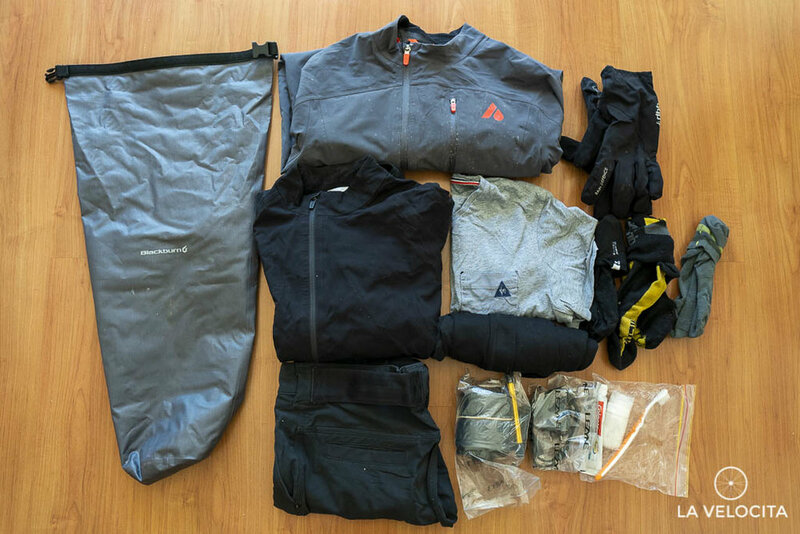 I put the Outpost through its paces on a bikepacking overnighter and immediately came to like the two-piece system. It’s much easier to pack the dry bag than a one-piece seat pack because it’s not attached to your bike. I’ve had dozens of bleary-eyed mornings awkwardly stuffing things into my Apidura bags and trying not to pull my bike over. Filling the dry bag, squeezing out the air, and clipping it up, then dropping it directly into the cradle is so much easier. Once in the cradle, it’s a much more secure system than the Apidura style. The cradle gives the bag structural rigidity with a thick underside, and a firm back. All of the clips have a locking mechanism that can be open and closed to let you crank on the tension easily once you’ve slotted in the dry bag. Apidura’s system needs the straps to be threaded through the clip to add tension and it’s more of a fight. While riding the bag has noticeably less swing and sway than the bags I’ve used previously. The utilitarian velcro seat post straps can be pulled very tight and the easy adjustment on the cradle clips help secure the dry bag. The thick underside of the cradle stops the dry bag from flopping about laterally too much. There’s quite a lot of adjustment in the straps too. You can tighten or loosen them to accommodate different gear quantities. I fit spare clothes and a few tools easily, with plenty of room to left in the bag. The cradle is great to quickly stash clothing in for quick access in changeable weather. My ride’s first day had some bizarre weather that switched between rain, hail, and sunshine every 30 minutes. I was able to pop open the cradle and put my gloves and jacket in, release the strips a little bit, and do the cradle back up. It meant I didn’t have to open and close the dry bag constantly and the apparel was easily accessible when I needed it. I enjoyed the Blackburn Outpost greatly on my test ride but there’s a couple of drawbacks you need to be aware of compared to the one-piece systems. The two-piece cradle and dry bag system is bulkier than the one-piece bag relative to storage capacity. The cradle system increases structural integrity but at the cost of storage so it’s less space efficient. It’s also heavier. It weighs in at 516 g for 10.5 litres of storage compared to my Apidura Expedition’s 350 g for 14 litres of storage. 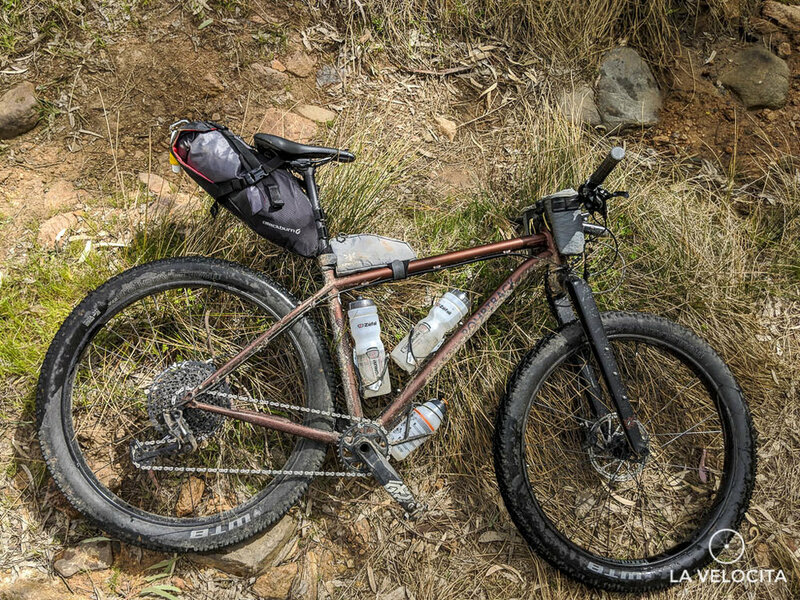 Those looking for ultimate lightness will be better served by the Apidura system. The Outpost’s straps are unfriendly to carbon seat posts too. They’re made to be simple and rugged. The Apidura Expedition has carbon friendly straps that left no marks on my Syntace P6 seatpost. The Blackburn Outpost is a tidy and convenient design. It’s two-part system is easily packed, easily adjusted straps, and reduces the annoying sway that inevitably happens with loaded saddle packs. It’s a very solid product for it’s $150-ish AUD price (depending on where you buy). It’s not the most space efficient bag, doesn’t like carbon posts, and is heavier than other brand’s offerings. Nonetheless, there’s a lot to like about the Outpost. I’ll be reaching for it when I don’t need the full 14 litres of my Apidura bag. It’s a darn good option for the starting bikepacker, or anyone looking for a more compact system than large one-piece bags. Disclosure statement: This bag was sent by Blackburn’s Australian distributor Sheppard Cycles. It is not a paid review. It seems British cycling fashionistas LUMO have been throwing strip-LEDs around again. This time they’ve landed in a backpack, specifically the Bermondsey. This British military-inspired rucksack packs a lot of cleverness into an already excellent bag.